I read a review of the 1980 UGA-Ole Miss game and the quote in the write up that really caught my eye was: "Rarely is Georgia-Ole Miss easy." 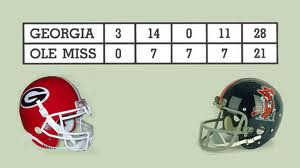 In '80, the Dawgs jumped out in front of the Rebels 17-0, and it did indeed appear to be easy. However, the guys from Oxford fought back to within three at 14-17 in the third quarter. The game ended up as a 28-21 Georgia victory, though hardly an easy one to be sure. Even though Ole Miss came to Athens that day with a record of 1-4, they pushed an undefeated Georgia team until the final gun sounded. The Rebels return to Sanford Stadium again as an underdog, but also as a revamping program that is playing quite well. Defeating a heavily favored UGA team 'Between the Hedges' would be Ole Miss' signature win for the season. I don't see it happening, but I don't see it being a cake walk for Georgia either. After all, rarely is anything easy in the Southeastern Conference.